No matter how good cook you are, unless you've not mastered the art of presenting the food in an appealing way, you're not justifying your talent. That's where different garnish styles play an important role in making your recipes, above the ordinary. 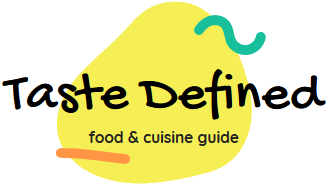 Without any doubt, there are countless ways to garnish different types of recipes. But, almost all of these styles can be broadly categorized into a dozen or so primary styles. 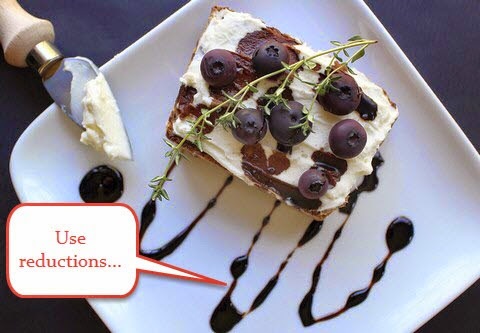 I've enlisted some of the popular garnish styles we commonly use for our recipes. I'm sure you've used some of these garnishes in your daily recipes. My personal favorite garnish styles are the use of powdered spices and herbs and drizzle of different types of aromatic reductions. Garnish with sprigs of herbs - This is perhaps the most popular and common garnishing method used across different cultures and cuisines. Fortunately, there are dozens of different types of herbs that can be used as a garnish. My favorites are basil, mint, cilantro, spring onions and many more. Always use seasonal herbs while using them as garnish. 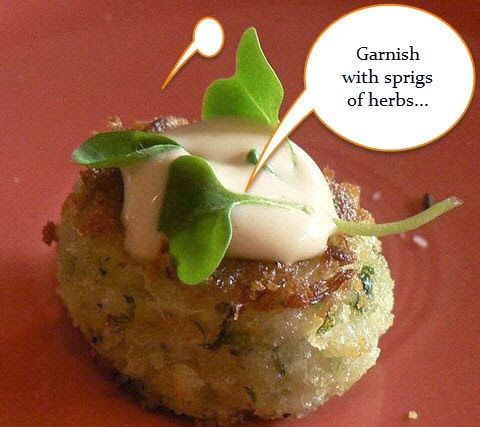 Garnishing with herbs is an art and one should not overdo it. Use few sprigs to get the right balance of garnish and delicious dish topping. Use reductions - Several main course dishes tastes best when they're garnished with aromatic and flavorful reductions. Vegetable, vinegar and fruit-based reductions are quite popular in different cuisines. Generally, reductions are prepared fresh and are used as garnish right before serving. Balsamic vinegar is an undisputed leader when it comes to making delicious reductions for main course recipes. I also make fruit juice based reductions for numerous light and mildly flavored recipes. Garnish with creams or dips - Whipped cream and flavorful dips are also used as a garnish for rich and spicy main course recipes. I often use mint based dips and seasoned whipped cream for garnishing rich gravy based preparations. In fact, you can combine multiple dips and cream base garnishes to add more kick to the recipe. 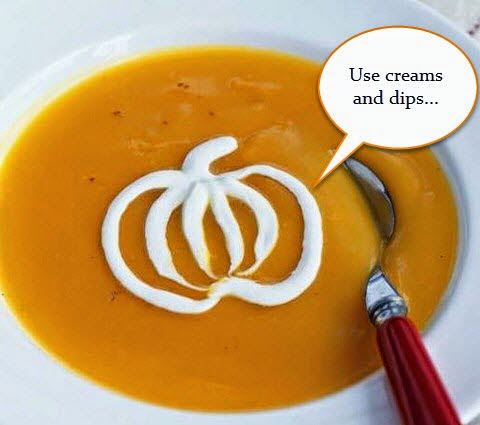 Avoid using canned cream while preparing such garnishes to ensure people relish it to the maximum. Use your imagination while using the cream as garnish. 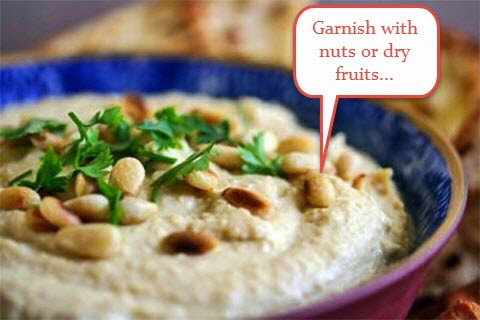 Use nuts or dry fruits - Various cultures generously use nuts in different forms as garnish. Mostly, they're used in the roasted and coarsely ground form. Nuts are often used with rice and meat-based recipes and are quite popular in the Middle East and South Asian culture. I use almonds, cashew nuts, pine nuts and pistachio as a garnish in roasted form. You can also combine two or more nuts and can garnish in coarsely diced form. You can keep roasted nuts in an airtight container for garnish. Garnish with fruits - Who doesn't love fruits? And, when used as a garnish, they simply rock! Small berries, grapes, and fleshy fruits are best candidates for garnish. My personal favorites are strawberries, guava, orange, and grapes. Sometimes, I mix fruits in cream and garnish with both of them in combined form. Use fresh fruit slices to ensure your garnish not only looks great but tastes good as well. 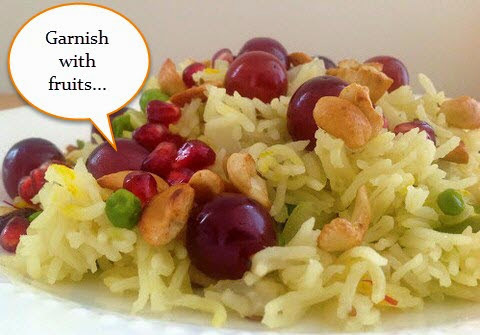 Fruits garnish is generously used with yummy desserts and aromatic rice preparations. Use chilies - Chili is a versatile eatable used in countless ways in different cuisines. One such way is their use in the form of garnish. Spicy green and red chilies are often used in different forms as garnish. Another popular variant is the use of bell pepper strips as garnish. 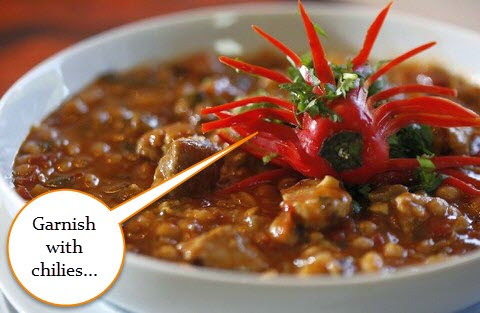 Generally, chili garnish is not consumed along with the main course dish. You can cut chilies in some innovative and unique ways (as shown above) to make your spicy garnish look irresistible and delicious. Garnish with powdered spices and herbs - Use of powdered spices and herbs in dried form is very common. Apart from using them as an effective flavoring agent, you can easily use them as a garnish too. 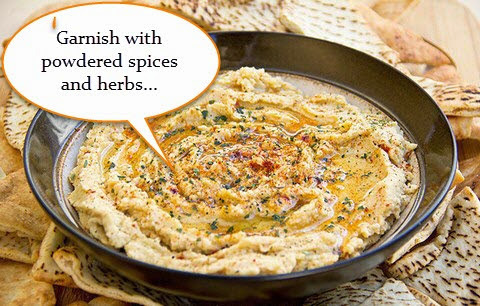 Combination of both dried herbs and powdered spices makes aromatic and flavorful garnish base. I generally use such kind of garnish with spicy curry recipes. You can also mix them with pungent and fruity oil like extra virgin olive oil before using as a flavor-packed garnish. Use grated cheese - And last but not the least, hundreds of cheese varieties are the best candidates for using as garnish. You can use them in melted, grated or crumbled form. 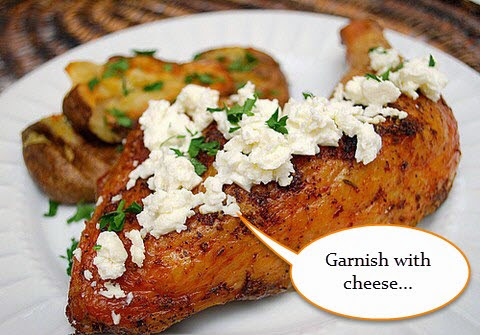 I prefer Parmesan and feta cheese as garnish. If you're using a cheese variety in melted form for garnish, you can mix it with cream and herbs to elevate the overall flavor. One can also use bean curd cheese or cottage cheese in crumbled or grated form to make a garnish for scrumptious roasted and grilled recipes.